What were developers reading on my blog and tweetstream in 2013? As a strong believer in transparency, I wanted to share the actual data from hits on my blog over the past year instead of just a popularity ranking. Using a combination of WordPress stats, Google Analytics, and RedMonk Analytics, I compiled a set of data that reflects what my readers cared about over the past year. This roughly corresponded to my second year at RedMonk (I started Dec. 1, 2011), so I wanted to take a look at how things changed since the year prior in addition to the raw numbers. Beyond being quite pleased at how well I’ve personally done, the disparity between a large increase in phone visitors and a near-constant rate from tablet users is noteworthy. It makes me wonder whether tablet ownership and usage among our generally predictive community is becoming saturated, while the same audience already owned smartphones and is just using them more. As is typical, the post traffic is highly asymmetric, with the top hits dwarfing the remainder. 3288: Are we getting better at designing programming languages? As always, developers love reading about rankings, data, and tooling, and the top posts reflect that. The surprises, to me, are some of the more conversational pieces — one on the Bay Area bubble and the other on SAP. Both of them got fairly strong traction within niche communities on Twitter, which may explain where the traffic came from. How are people getting here? In terms of the top sources of inbound traffic, search (namely Google, which dominates search at 99.3%) was the best draw of readership. Social media and Twitter in particular, however, topped search as a category, with Twitter alone garnering roughly 2/3 of the visits that search did. Below is a map from Google Fusion Tables that I’ve colored by continent. Deeper greens indicate more visitors, which are absolute rather than normalized by population. There’s very strong representation among Western countries with 85% of visitors coming from the Americas, Europe, and Australia. This comes as no great surprise since they share the same Latin alphabet and the majority are likely to speak English well. In fact, I’m quite pleased to have as many people from Asia in particular as I do, but also South America and Africa, because it provides some additional insight about what those developers are doing similarly and differently from their compatriots. Graph courtesy SumAll. I signed up for their service in September so “mention reach” is missing before then. Retweet reach (how many total followers see my tweets by following the RT chain) in a typical week is around 75,000. Mention reach (whenever I’m credited, even when I didn’t originate it) has been near or above 500,000 three times since I signed up for SumAll in September. It typically hovers around 3x–5x my RT reach, indicating a combination of independent discovery of my content and Twitter clients that quote me or use the letters “RT” rather than a Twitter API retweet. I’ve had reasonable success in making data graphics go viral on Twitter — each of the 3 highest peaks over the 4 months where I tracked mention reach was the result of me tweeting a graph based on my original research. Across the entire year, my retweet reach was 4.02 million users. SumAll didn’t calculate mention reach before I signed up in September, but based on the 4.79 million in the last trimester and the typical multiple mentioned above, I would estimate around 10–25 million users encountered my name this year if that 3x–5x ratio holds true. 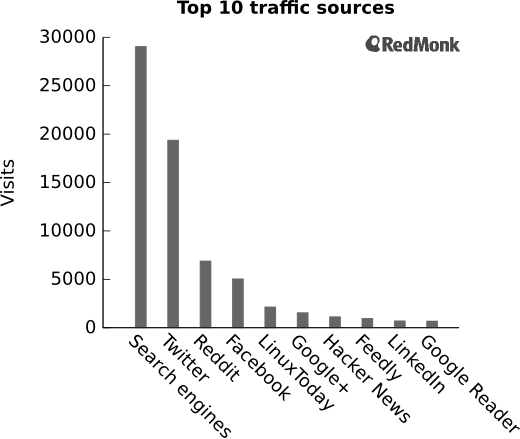 2013 was a great year for my RedMonk research, with a gratifying growth in readership over 2012. On average I published 3 posts per month, which I hope to improve in 2014 with a more focused approach to how I balance research time in terms of collection vs production. Disclosure: SAP and GitHub have been clients. Automattic, Google, Twitter, and SumAll are not clients.